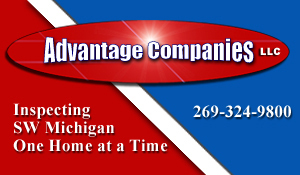 Welcome To Advantage Companies, LLC! If you are looking for friendly first-class service, you have come to the right place! Our goal is to educate you as much as possible about the home you are purchasing. We feel it is important to do a walk through and review with you, if possible (usually 30-60 minutes) at the end of the inspection. Of course, you are welcome to be there from start to finish ... we will answer all of your questions and you can learn a lot of interesting things about your new home. 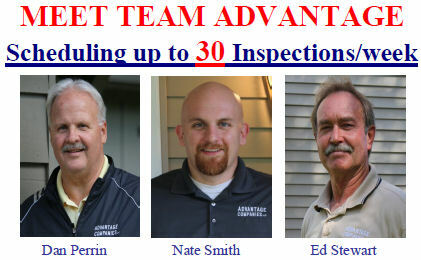 There is usually a short window of time (5-10 days from date of the last signature on the Sales Agreement) for you to complete your due diligence inspections - (Home/Radon/Pest) For One Stop Shopping: Contact us as soon as possible to get the best inspection slot available for your busy schedule. We listen to you and provide as much information about your new home as possible - to help you make decisions moving forward. 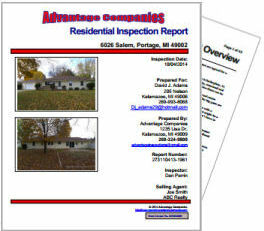 A home inspection is an objective visual analysis of a homes Health, Safety, Structural and Mechanical systems that may affect your Sales Agreement. An Inspection will help determine the areas of a home that may not be performing properly, items that may be approaching or are at or beyond their useful life expectancy and or may be unsafe. Inspections will include areas of the homes interior and exterior from the roof to the foundation and the exterior drainage and retaining walls. If problems or symptoms are found the Inspector may recommend further evaluation. A home inspection is a visual inspection to help determine potential problems or conditions that may exist at the time of the inspection.